Everything needed to maintain a clean, pristine instrument & mouthpiece daily resides in this small pouch that easily fits into a gig bag for on the road and everyday practice sessions. This is NOT a cleaning product, but a drying product to be used on a clean horn once a day after your last session. 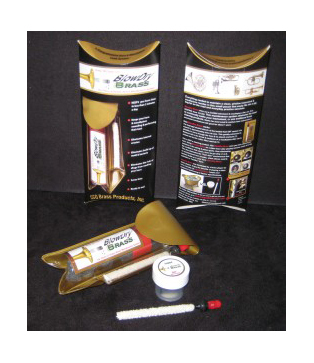 BlowDry Brass dries out a CLEAN instrument & mouthpiece after use, thus KEEPING them CLEAN. This maintenance system eliminates the need to continually bathe your instrument, or use traditional brass cleaning products. Works for most small & medium bore instruments & associated mouthpieces (kit good for about 1 year). The isopropyl alcohol drench of the loaded foam BIT causes it to expand to approximately twice its size. This greatly enhances its pliability to move through the horn & to absorb moisture. Moisture left in the throat & backbore of a mouthpiece after use is wicked out by the cotton filled ramrod. Use BlowDry Brass once you have cleaned your horn. BlowDry Brass was developed by a brass player for brass players. Enjoy the benefits of playing a clean horn everyday . BlowDry Brass keeps your equipment performing to factory specifications. COMING SOON: MORE INFORMATION & TIPS ON HOW TO GET THE MOST OUT OF BLOWDRY BRASS. Refills for this kit will be available (10 BITs & 1 ramrod). Hi, My name is Lisa and I have been a musician my entire life. Like many of you, I work long hours in pursuit of my passion and I just am not enamored with the maintenance of cleaning my instruments, but enjoy all of the benefits that come with playing a clean instrument and mouthpiece. BlowDry Brass is the only daily brass maintenance product in the industry that keeps the entire instrument and mouthpiece clean. Playing on consistently performing equipment, every day, is why I developed BlowDry Brass. Thank you to all the musicians and promoters who have endorsed this great product. Copyright © 2019 Blow Dry Brass. All Rights Reserved.